Heritage Dental Group is committed to caring for children’s smiles and their overall dental health. We know how important a great smile is for a child’s confidence and we are passionate about educating children from an early age about the advantages of looking after their teeth and gums. At Heritage Dental Group, our team takes special care in encouraging and training kids in good oral hygiene routine. Kids also receive their own oral hygiene kit, brush holder and oral hygiene instructions to look after their teeth. Dr Singh recommends 6 monthly check-ups for all age kids. We BULK-BILL dental treatment for eligible kids under Child Dental Benefit schedule. We are introducing an exciting initiative to involve kids in their oral health care. We welcome you to bring your Kids for their first complimentary orientation visit to our Dental practice. 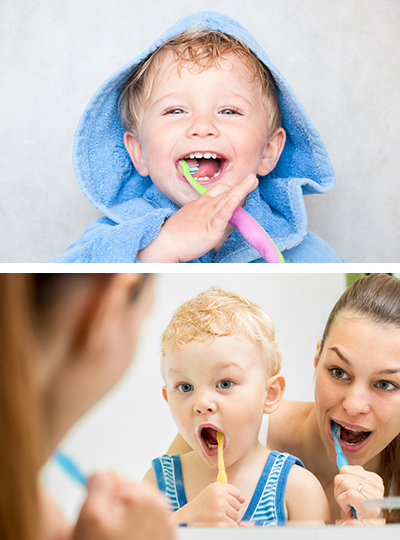 Oral hygiene plays an important role in children’s growth along with many other milestones. By training kids in good oral care habits of brushing and flossing, making healthy diet choices and making them aware of choosing water over acidic and sweet drinks, you are giving them the best chance to have healthy teeth for the rest of their life. We are introducing an exciting initiative to involve kids in their oral health care. Our Team will encourage you to bring your little ones for an orientation visit, where they will get to meet the Dentist, Dental assistant and have an experience of the dental office. In this visit, we will only talk about how many teeth they have, how often they brush their teeth and what type of foods are good and bad for teeth. Kids will receive stickers and oral care instructions. Our dentists are trained to ease children in to dental procedures so that they do not develop phobias that can severely impact a child’s future dental and general health. There are special toothbrushes designed for children to fit in the mouth and clean their teeth properly as they grow. It is advisable to use children’s toothpaste as they have a lower concentration of fluoride than adult toothpastes. Read our blog post on how to make your child’s dental visit comfortable? Healthy Eating – Cavity causing foods are those with a high sugar content. To reduce the risk of tooth decay it is important to reduce the total intake of sugary foods and the number of times sugars are eaten throughout the day. Healthy Drinking – Children should drink plenty of plain tap water and limit the consumption of soft drinks, sports drinks, cordials and fruit juices, which generally have a high sugar content. 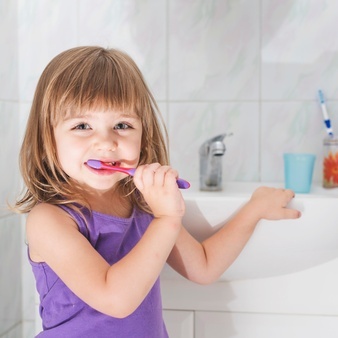 Brush Twice a Day– It is important for kids to clean their teeth at least twice a day with a gentle but thorough brushing action using a soft brush with a small head and fluoride toothpaste. Correct regular brushing will reduce plaque build-up and tooth decay and help maintain healthy gums and teeth. Up to age eight, kids will need assistance to brush correctly, as most children lack the manual dexterity to brush correctly before eight years of age. Floss Daily – Children should floss between their teeth every day to remove food and plaque from the spaces between teeth where their toothbrush may not be able to reach and clean. Supervision and assistance from an adult is highly recommended to ensure that kids adopt a daily flossing routine. Visit Your Dentist Regularly – It is recommended that from age three, children visit the dentist every six months for a thorough check-up. Regular check-ups from an early age reinforce good dental care and assist in reducing the need for fillings in the future. Wear a Mouth Guard For Sport – It is important to play safe in all sports by protecting children’s teeth with a custom-made, professionally fitted mouth guard. Mouth guards are available in a range of colours, even team colours, and should always be worn when training and playing sport to minimise the risk of dental injury. Visit Australian Dental Association website for more resources and information on Dental Health.